EUTELSAT 172B, the first high power all-electric telecommunications satellite, is now ready for shipment on 20 March from the Airbus satellite assembly facility in Toulouse to Kourou, French Guiana for Eutelsat, one of the world’s leading satellite operators. The satellite will be launched into orbit on an Ariane 5 in April, and will provide enhanced telecommunications, in-flight broadband and broadcast services for the Asia-Pacific region. EUTELSAT 172B combines electric power of 13 kW with a launch weight of only 3,500 kg. It hosts three distinct payloads that will strengthen Eutelsat’s capabilities across Asia-Pacific markets: a C-band payload, a regular Ku-band payload and a high throughput Ku-band payload designed for in-flight connectivity along Pacific air corridors. 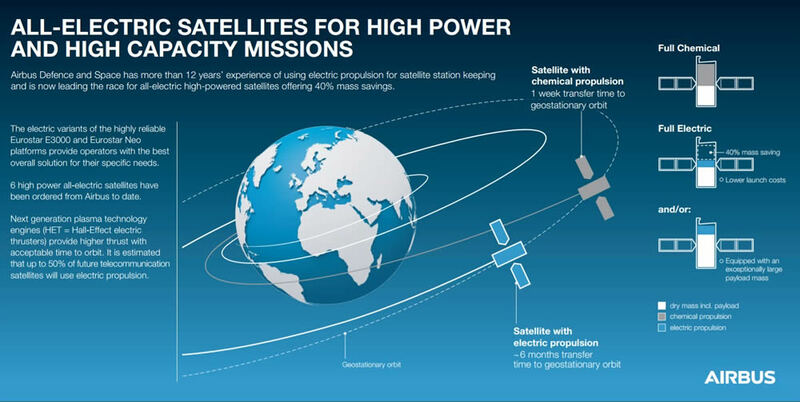 The satellite also incorporates other state-of-the-art features, in particular the flexibility to dynamically distribute power between the 11 elliptical beams in the high throughput payload. "Using electric propulsion for initial orbit raising and all on-station manoeuvres has led to a substantial weight reduction, enabling the satellite to be launched in the Ariane 5 lower position and offering more competitive launch costs,” said Arnaud de Rosnay, Head of Telecommunications Satellites at Airbus. Underpinning EUTELSAT 172B is Airbus’ highly reliable Eurostar E3000 platform in its latest EOR (Electric Orbit Raising) evolution. The development of Airbus’ Eurostar all electric platform has been supported by ESA and space agencies of European countries, in particular in France by CNES in the framework of the PIA programme (Plan d’Investissements d’Avenir).